As scientists we are used to data analyses providing information, but it is less common to see data analysis directly informing management decision-making. Experience of using and developing control charts which has been established over the past eighty years, can provide methods which will help the conservation manager to build a more complete understanding and therefore make better decisions. An example suggested by Black (2015) shows how the increasing trend in manatee deaths, although potentially attributed to a growing manatee population, can also be identified to occur in three separate stages. The stabilisation of counts at each stage indicate a new ‘status quo’ has been established. In this case the introduction of watercraft speed limits established a new ‘status quo’. 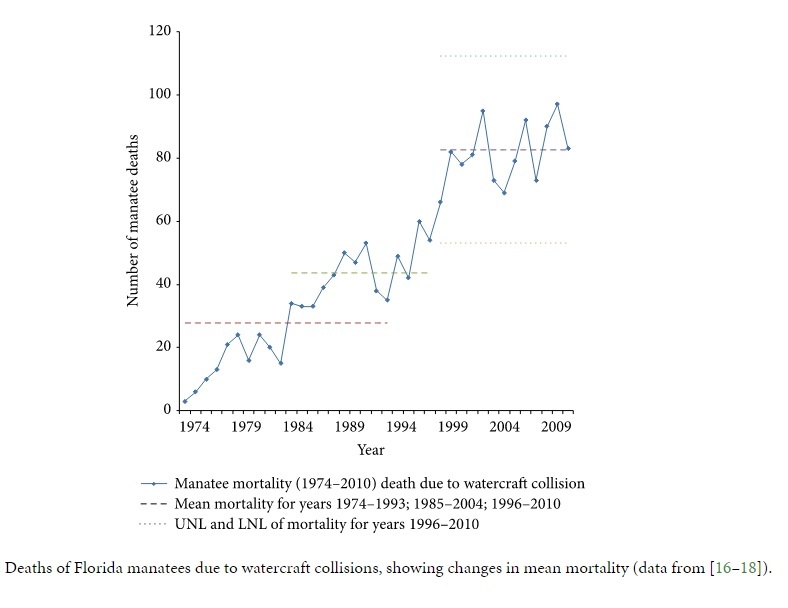 In other words, increases in manatee mortality are not inevitable if management decisions can be made which stabilise and improve the system – for example can other waterway management measures be implemented? The Details AND the Big Picture: how do we keep the balance? A ‘helicopter view’ is an important capability for a conservation leader. The leader needs to be able to examine details of the programme, then position that knowledge in the context of the wider programme purpose and vision. This includes how budgets are organised, resources planned, goals set and how external partnership are arranged. With a helicopter view the leader is well placed to delegate and coach the team, to intervene and support where needed, to revisit, change or improve approaches where required. Most importantly the leader can see where ‘the way things are done’ helps (or doesn’t help) the achievement of the team’s purpose. See and understand internal & external organizational dynamics. Know projects’ sphere of influence—identify solvable problems. Establish budgets and a clear fund-raising strategy. Provide information, technology & resource to assist the work. Encourage cooperation & sharing with partners to improve work. Be prepared to seek specialist advice from external sources. Integrate flexible management with professional/scientific rigor. Use data on staff, communities, or society if it helps the program.